I finished a WIP (that's Work In Progress)...finished as in, fully quilted, and binding sewn. This quilt had no real purpose other then I was determined to make it; but clearly my definition of determination meant that it could sit for years, taunting me. 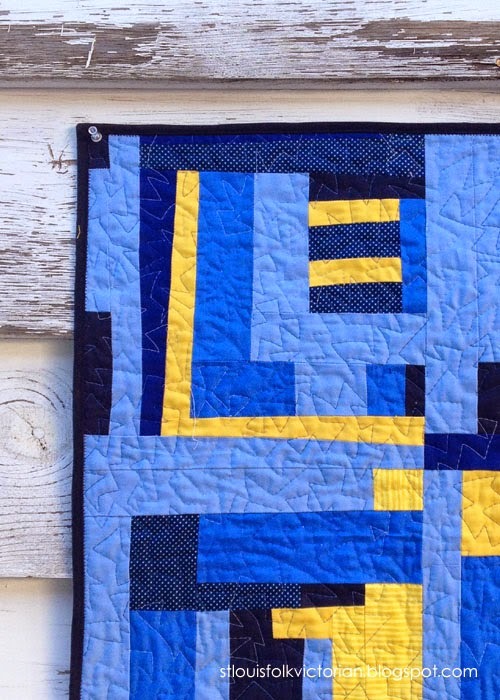 This quilt came about right at the beginning of my admiration with modern quilting. I remember coming across this quilt with it's limited palette and knew that I wanted to make a similiar one, one day. I started strong; but then something happened and soon enough this quilt only made an appearance at my St. Louis MQG sew-ins; where I would add a block or two. I even talked about it's unfinished status back in this WIP Inventory & Skeletons post from January 2012. Earlier this year my St. Louis MQG posted a challenge to each of it's members, encouraging them to finish their old WIP. I couldn't stand by and watch everyone else finish their older projects, so I found a few of my own; but sadly had not made much progress this entire year. This past week, that determination (you know from 2010 when I bought the fabric) finally took hold and I finished it. Now let me tell you, I absolutely adore this quilt; and the only down-side is it's size. This one measures approx. 46" x 57" and is not really a usable size except for a child. Yet at the time when I purchased the fabric, this would have been one of the larger quilts that I attempted. Clearly my skills have improved since 2010, having made and quilted quilts nearly 4x this size; and maybe that's why I have put off this quilt for so long, or at least that's what I'm going to tell myself. 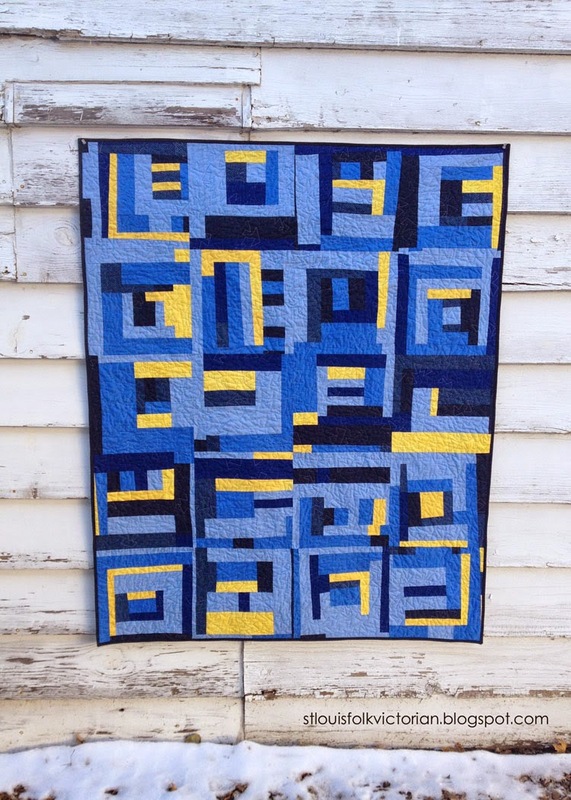 I chose to do a free-motion, meandering, triangular quilting design using a blue-multi thread; which I think adds to the appeal. Finished Size: 46" x 57"
Now that I've finished this WIP, maybe I should tackle some of the others. I'm not entirely sure how many WIP I have though, which is something I'll tackle another day and in another post. 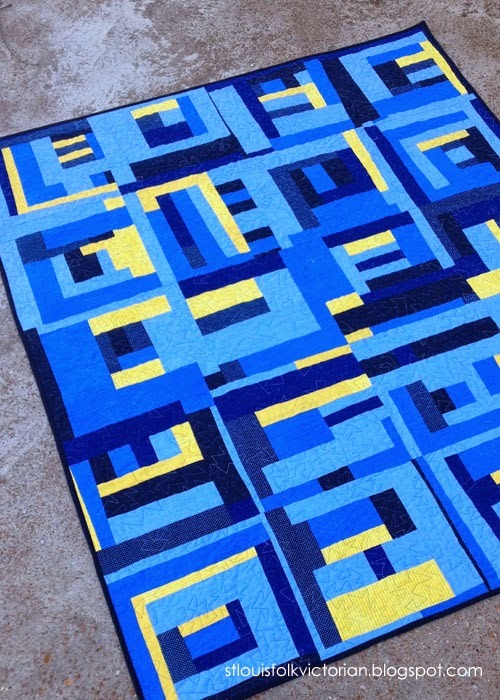 I love this quilt and am so glad you have finished it. My favorite color combination is blue and yellow. I want to make a poem out of this. What a beautiful quilt. Something Blue. It would make a lovely poem. This is gorgeous! I found your blog by seeing what you made for the #IGminiswap . GORGEOUS!! !